Shock News: God and Devil join forces!!! Theologians world-wide have been baffled by an unprecedented development from the spirit world which saw God and the Devil join forces. 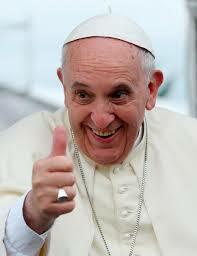 Rumours abound that the Pope is actually planning to cut short his American Tour to address the issue. I'm talking about the 'stampede' in Mecca which at the latest count (the number gets bigger and better by the minute) has squashed nearly 1,000 ragheads. Now let me be clear on this. I hold no brief for the Devil and never have. But in all fairness what would you do if you had millions of mad-eyed fanatics pounding you with stones for days on end? Especially were you in possession of supernatural powers? Well of course you'd smite them. Totally pissed off he decided to start a stampede. And when Muslims stampede there's going to be only one outcome. A happy one. Now we learned in this post that the collapsing crane which smote nearly 200 of the same people a few days ago was an Act Of God. 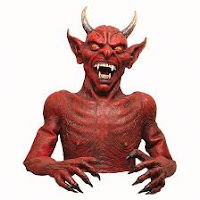 So you see, He and the Devil are - incredibly - on the same side. At least for now. This heartening development has unfortunately given rise to a serious logistical problem. 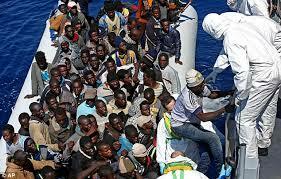 Muslim 'scholars' have calculated that no fewer than 55,152 virgins (72 x 766) will be required immediately to service The Squashed when they reach the Great Bordello In The Sky. To which all I can say is don't come looking around my neck of the woods where virgins are as rare as black geniuses. Occasionally an event occurs which fills me with warm contentment, inducing me to tip my hat at a jaunty angle and walk with a spring in my step. 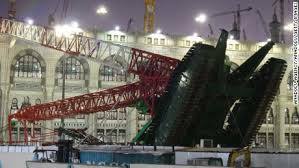 Such a happening occurred this week with the collapse of a giant crane, owned by the Bin Laden family no less, onto the Grand Mosque in Mecca, squashing 140 head-chopping goat-fuckers in its steely embrace. Adding spice to the mix was the inclusion of 14 Nigerians among the squashed. What could be better? Well, higher numbers obviously. But hey, these days I'll take any bit of good news I can get. Will we now begin to see reports in the Western "news" media of a figure resembling Putin running from the scene? Well Mr. Bin Laden for one doesn't see Vlad as the guilty one. After detailed discussions with a crack team of Saudi engineers he deemed the event to be 'an Act of God'. In which case all I can say is well done God, and please continue Thy good work. And I wish Thee the best in any lawsuit the insurance company may take against Thee. The Jewish power structure has been central to the anti-White Agenda. As I regularly point out they've been responsible for "feminism, demonising Whites and elevating blacks, mass immigration to White lands, miscegenation, ethnic displacement, Affirmative Action, destruction of the family and other traditional institutions, debasement of our education and legal systems, defilement of art and entertainment and an overall degradation of society in general." Let me give you an example of what I mean. I'm currently watching Show Me A Hero from Director David Simon (of The Wire fame). This mini-series traces, or purports to trace the transformation of Yonkers NY by the imposition of social housing tenants (read impoverished black and Puerto Rican criminals and welfarists) on the existing White (mainly Irish and Italian) neighbourhoods. The battle went on for nearly twenty years with Federal judge Leonard Sand using every weapon at his disposal - including fines and imprisonment - to bend the Yonkers Councillors to his will. He won in the end. And Yonkers lost. It went from being quiet and middle class, a place where you left your door open at night, to one whereby this small city of 200,000 now has more gang arrests per capita than any other part of New York. So what we have here is a legal challenge lead by a Jew (Michael Sussman) on behalf of a Jewish-controlled organisation (the ACLU) and ethusiastically backed by Jew Joshua Bogin at the DoJ, overseen by a Jewish judge applying legislation largely based on the work of Jewish political 'scientist' Catherine Bauer which was ushered through Congress by Jewish legislators and their dumb/bribed/compromised goyische enablers, all of whom are misrepresented as heroes (and the Whites as degenerate ignorant racists) in a series by a Jewish Director shown on a Jewish owned channel and based on an original story by Jewish author Lisa Belkin. This scenario is not the exception, it's the norm. It's been repeated all over the United States and in different forms in every White country. Today marks another anniversary of the September 11 2001 attacks in which the Cessna pilots not alone performed a series of miraculous aeronautic manoeuvres beyond the capability of most Boeing pilots but changed the world in fundamental ways. Not least in facilitating the introduction of a raft of neo-Stalinist legislation and launching a fusillade of Bombs For Peace throughout the Arab world. And here I hope you'll all join me in offering condolences to two of the attack's biggest victims. 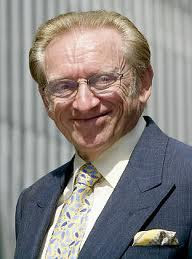 First Larry Silverstein, devastated by the loss of three of his beloved WTC buildings - a loss admittedly assuaged by a subsequent massive insurance payout. Dov Zakheim, the second beneficiaries of our condolences, might at first glance appear an unlikely victim. But he is. 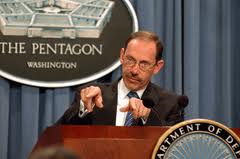 You see Zak had the misfortune to mislay three thousand billion dollars during his stint overseeing Department of Defense finances. And the team investigating the loss, who Zak was confident would have found him totally blameless, were wiped out by the missile - I mean plane - that hit the Pentagon that day. Together with all the evidence they had accumulated. Imagine how Zak must have felt when he heard that! Anyway, my commiserations and condolences to both of you guys on this sad occasion. When David Hume argued that reason is a slave to the passions he did so approvingly. "Reason is, and ought only to be the slave of the passions, and can never pretend to any other office than to serve and obey them'. Hume realised that reason can inform us but does not determine our actions. Reason is more like a semaphore in the computer programming sense, controlling, filtering and enhancing access to data. Or like a secretary mediating the flow of data to the CEO. But the CEO makes the decisions. And those orchestrating the ethnic destruction of Europe fully understand this concept. Hence the masterful use of that drowned Syrian child's image. Given that there is no rational basis whatsoever for allowing Arab and African invaders swarm all over our lands they reached for the emotions. And boy, has it worked. Whether or not the child's body was realigned to maximise emotional impact (strong rumours circulating to this effect) is not the point. The point is that once again a critical mass of Whites has been emotionally blackmailed into facilitating their own destruction. The man who transformed this form of manipulation into a virtual science was Edward Bernays. And yes, he was one of the Tribe. 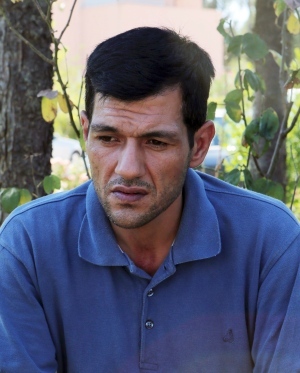 Abdullah Kurdi, the father, has duly become an overnight sensation. A fact underlined by conniving creep Simon Cowell, always on the lookout for the next passing bandwagon, wanting to meet his new 'hero'. 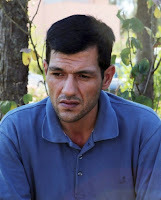 Kurdi has been offered accommodation by thousands of trendies in the West, while the Canadian Government reels under accusations of 'inhumanity' for rejecting his asylum application. Although the boy's aunt, currently roosting in Canada, with laser-like accuracy focuses in on the real culprits. "The whole world is to blame". Thank you madam, that's very helpful. Even if we accept Kurdi's story (which, as Uncle Nasty has shown, is coming apart at the seams like a cheap suit) the inherent absurdity of the Cathedral's Narrative quickly becomes obvious. First he was living safely in Turkey, had a flat provided by the Government, was employed and had several thousand Euro in cash. But "I was hoping to provide a better life for my children". And not for himself, we're left to infer. So what did he do? Hired a rickety boat, packed his family onto it without life-jackets, and when it capsized saved himself while his family drowned. I repeat, this represents his (unvarnished) version of what happened. So rather than being lionised as a hero and victim he should be charged with reckless endangerment, even manslaughter. And all for the want of 'a better life'. Look buddy, everyone wants a better life. The guy who marries a rich woman wants a better life as does the guy who robs a bank. Wanting a better life entitles you to absolutely nothing. But all of this is irrelevant. There's a Programme in place, a Narrative to be spun. 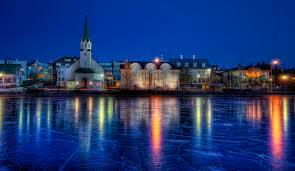 The Icelanders are an amazing and admirable people. With a language and culture going back over a millennium, they have survived in one of the world’s most inhospitable environments. Frozen over for half the year, and at any time liable to be engulfed by an earthquake, smothered by a volcano or swamped by a tsunami , they have not alone survived, but prospered. You should note that this capacity to prosper in adverse conditions is the polar opposite of Africa, where, even with abundant natural wealth and resources, the population is mired in poverty and ignorance. I wrote that paragraph in this post, lamenting the impending slow destruction of this unique people's identity: 60% Nordic, 40% Celtic (Irish/Scottish). But the impact of the African breeding pair I referred to pales into insignificance compared to what now looms on the horizon for this tiny nation of fewer than 300,000 people. "More than 11,000 families in Iceland have offered to open their homes to Syrian refugees" proclaimed the headline in the London Independent. 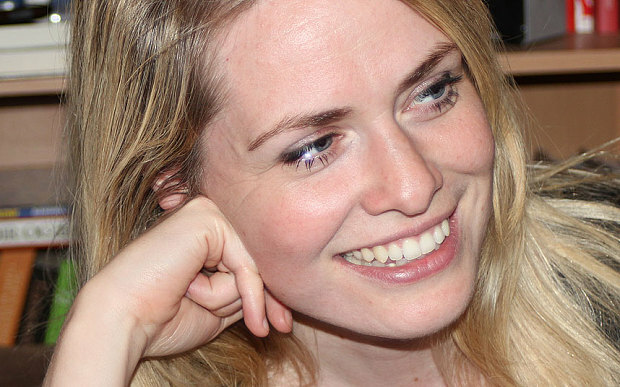 Bryndis Bjorgvinsdottir (pictured) the architect of this monstrous scheme, is almost a caricature of the modern female, adherent of a masochistic self-annihilating ideology exacerbated by toxic status whoring, she's single, has but one child, and no commitment to any man. She'll end up of course alone in a room of hungry cats. But meanwhile she and her ilk will have destroyed the country that nurtured them. By way of a Facebook campaign she's succeeded in convincing 11,000 Icelanders to open their homes to an army of 'Syrian refugees'. Which as we know in practice means anyone claiming to be a Syrian refugee. Read Africans, Afghans, Pakistanis etc. People like those in the bottom picture. Imagine the impact tens of thousands of these primitive humanoids will have on the unique Icelandic gene pool. Within a few generations the country will be destroyed, no more. Because the invaders, unable to create or sustain a civilisation in their own more hospitable environments will abandon Iceland once that country's native inhabitants have been bred out of existence. Another sumptuous achievement of the White race will then slowly revert to its natural state, an abandoned land of snow, ice, earthquakes and volcanoes.